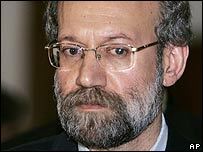 One of Iran's top officials, Ali Larijani, has become the most high-ranking officials from his country to visit Iraq since the 2003 war. He met Iraq's prime minister in Baghdad and its most senior Shia cleric in Najaf, during a tour ahead of this week's Iraq security conference. After meeting Grand Ayatollah Ali Sistani, Mr Larijani denied Iran was stoking violence in Iraq. Instead he blamed Iraq's troubles on American "misbehaviour and misconduct". The US has not ruled out talks with Iran at this week's conference in Egypt, called to help stabilise Iraq. The summit, which starts on Thursday, will bring together Iraq's neighbours and other regional and international powers. US Secretary of State Condoleezza Rice says any talks with her Iranian counterpart Manouchehr Mottaki would focus solely on the situation in Iraq. The US refuses to open direct discussions with Iran on the latter's controversial nuclear programme, until Iran suspends uranium enrichment. Mr Larijani said there was no truth in US claims that Iran's agents are fuelling the insurgency in Iraq and assisting attacks on US troops. "The Americans know Iran has always supported the political process in Iraq," he said after meeting Mr Sistani. "They know where those terrorists are coming from, because they usually come from countries friendly to the United States," he added. Mr Larijani's visit to Iraq comes at a crucial moment, when the US is trying to persuade all of Iraq's neighbours to play a more positive role in reducing the violence there, says the BBC's Middle East analyst Roger Hardy. Mr Larijani, who visited Najaf after talks in Baghdad, seems to be sending a double message, he says - of reassurance to the Iraqis, and continued opposition to the US presence in Iraq. But while the US wants to keep the Iraqi issue completely separate from Iran's nuclear programme, Iran is keen to link the two. It is ready to help the Americans stabilise Iraq but only if they, in return, ease up the pressure on the nuclear issue, our correspondent says.